Other Products by Body Science. Search other Protein Powder products. Some people slam down whey protein shakes after exercise. Others use them throughout the day for snacks. But no matter when or how you use them, whey protein powders have become one of the most popular sports nutrition products to reach the global marketplace. And there's good reason for it. Obviously, with this many protein powder users worldwide, people are noticing benefits. Whey protein is a high biological value protein, indicating that it contains an excellent balance of amino acids. This is why whey protein, just like BSc Whey Protein Ultra, is so effective at stimulating muscle healing and adaptation to exercise. BSc Whey Protein Ultra is perfect for muscle recovery after exercise. This is where micro-damage to muscle will be healed, in time, and made stronger to better resist any further wear and tear. This is essentially why muscles grow. Because we stress them. And in order to prevent future damage the muscle builds itself bigger and stronger. So although we need to train, we also need quality nutrition to assist with proper recovery. Otherwise, we won't be making the most out of our time spent training. This is where quality protein food is important. Many people use protein powders as a convenient way to boost their protein intake. 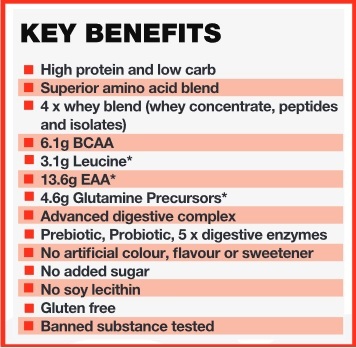 BSc Whey Protein Powder contains no artificial flavours, colours or sweeteners. It is naturaly sweetened with Stevia. It also has added digestive enzymes, two of which are protease and lactase. These enzymes assist with protein and lactose (milk sugar) digestion, respectively. 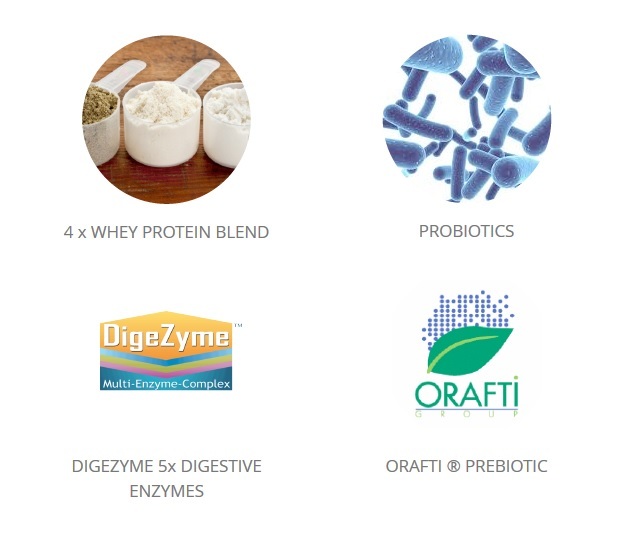 On top of all this, Body Science have added prebiotics and probiotics to assist in keeping your gut healthy. Prebiotics are the food that probiotics or beneficial bacteria thrive on. So this really is a well-rounded product. BSc Whey Protein Ultra is an awesome member of the ULTRA RANGE of products from this market leader in sports nutrition supplementation. Mix 33g (2 Scoops) into 300ml Cold Water and consume. 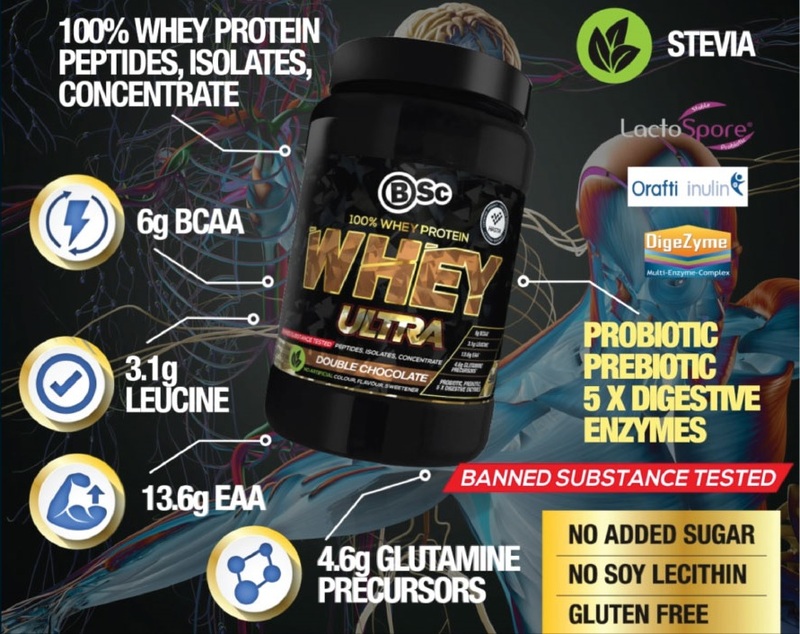 BSc Whey Protein Ultra INGREDIENTS: BSc Protein Blend (Whey Protein Concentrate, Whey Protein Isolate, Hydrolysed Whey Protein Isolate, Emulsifier [Sunflower Lecithin]), Cocoa Powder (5%), Natural Flavour, Prebiotic Fibre (Orafti Inulin), Proiotic (Lactospore Bacillus coagulans), Sweetener (Steviol Glycosides), Digezyme Digestive Enzyme Blend (Amylase, Protease, Cellulase, Lipase, Lactase).